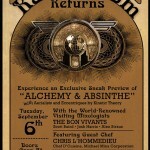 Cocktail enthusiasts rejoice: after far too long a hiatus, Radio Room returns to The Edison on Tuesday, September 6th. 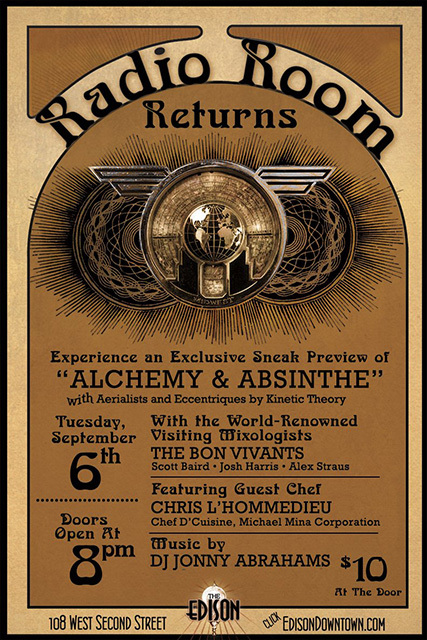 The popular monthly event, which went dark over a year ago, is back in a big way with special guests The Bon Vivants: Scott Baird and Josh Harris from San Francisco, and LA’s own Alex Straus (Hemingway’s Lounge). Yamazaki brand ambassador Neyah White will also be in the house. To pair with the libations, The Bon Vivants have invited their friend Chris L’Hommedieu (Chef de Cuisine, Michael Mina) to create a menu of small bites. The Edison will also present an exclusive sneak preview of Alchemy & Absinthe, featuring aerial contortionists and interactive characters by Kinetic Theory.